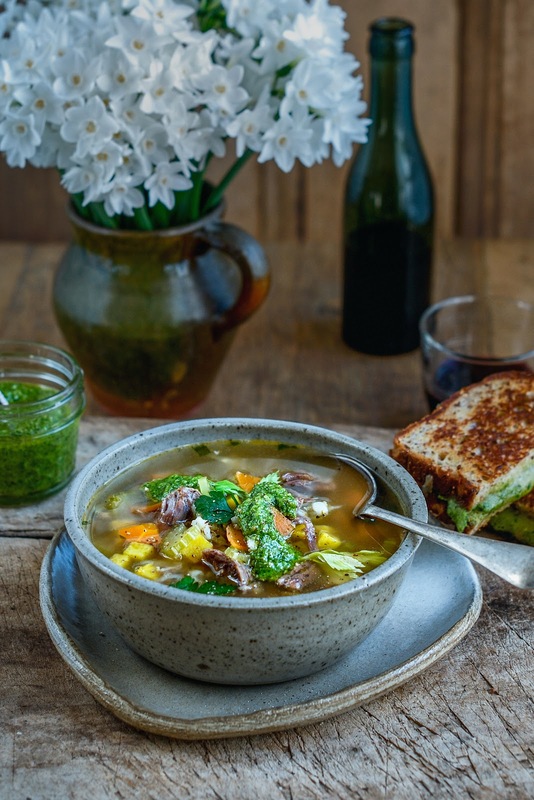 Quick l’il re-post of this perfect winter soup, originally posted waaaay back in September 2015!I am writing this as I watch the weather forecast on TV, and despite the fact that it is now officially spring in New Zealand, the weather forecast is predictably grim: 0˚ or 1˚C degree lows in many places over night (-2˚C in Christchurch!) and rain all over the country in the next few days. Soooo even though the shops are full of spring fashion – this is a good option for lunch or dinner over the coming weekend! 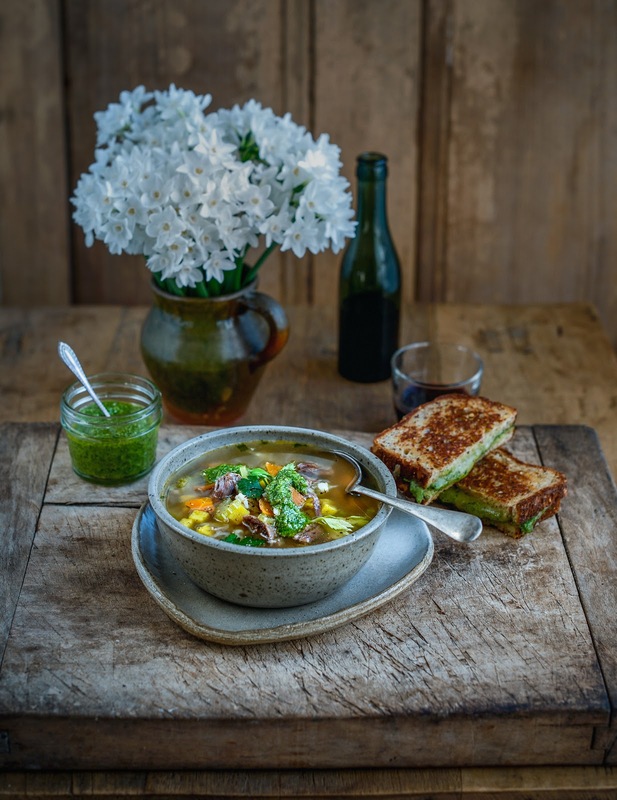 This soup (which I put together for Fairfax) reminds me of my childhood – it’s very similar to one made by both my mum and paternal grandmother…minus the pesto 🙂 The irony is that even though it sets me off into fits of nostaligia, it is also just the soup for budding hipsters, made as it is with a bone broth stock. 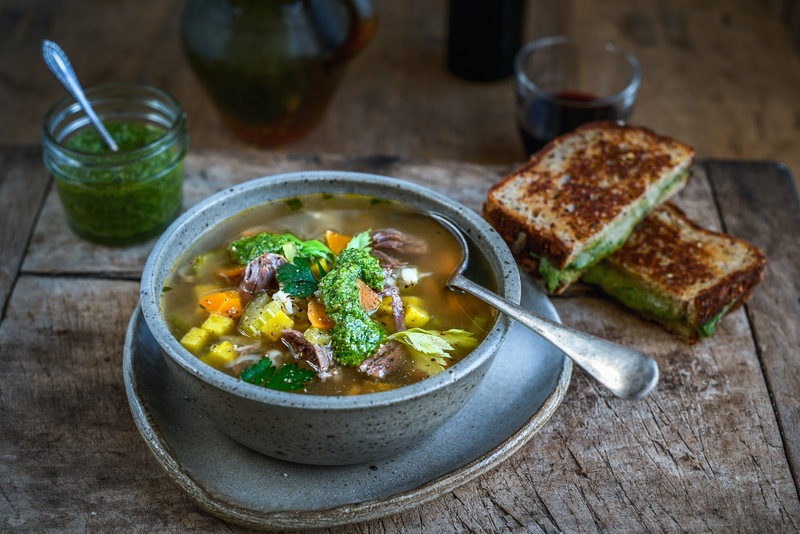 Bone broth – hee hee – to me it’s just stock and reminds me how everything old can be new again, ideas go in cycles (whole foodies, of which I am kind of one – erm – check out the 70s, Mollie Katzen and Moosewood! ), but I do love it that ideas that make sense stick around. Put beef shin in a very large pot and cover with 3 litres of water. Add cider vinegar, onion, roughly chopped carrot, roughly chopped celery, bay leaves, parsley and peppercorns and season with salt. Bring to the boil then reduce heat and simmer, covered for four hours. Chill, remove fat from surface and strain stock. Reserve meat and return stock to a gentle boil. Add barley and simmer 30 minutes, then add remaining carrot, celery, parsnip and kumara and meat shredded from the bones and cook a further half hour before serving with a sprinkling of parsley and a dollop of winter pesto. You can add whatever vegetables you like to this soup; zucchini, peas, cauliflower, broccoli and leeks all work well. Whiz all ingredients together in a small food processor and season to taste with salt and pepper. To make toasties, butter bread on 1 side and place buttered side down in a hot fry pan. Spread bread with pesto and top with grated cheese. Top with bread ‘lids’ buttered side up. When golden on the bottom, flip to cook the other side. Such a perfect soup for the upcoming cooler months here in Canada! And this pesto and the toast on the side just add even more warmth and comfort to this meal. Delicious! Delicious but the barley soaked up a lot of the broth so had to add water at the end. That's no good – did you have the lid on while cooking the stock? If not too much liquid may have evaporated. I will update the recipe to make that clear. Thank you so much for letting me know and my apologies! Oh – I see it already says that – hmm, a mystery then! Yes the lid was on. I might have had more like 1.8kg meat so could have added more water at the beginning. Forgot to mention the pesto was awesome.